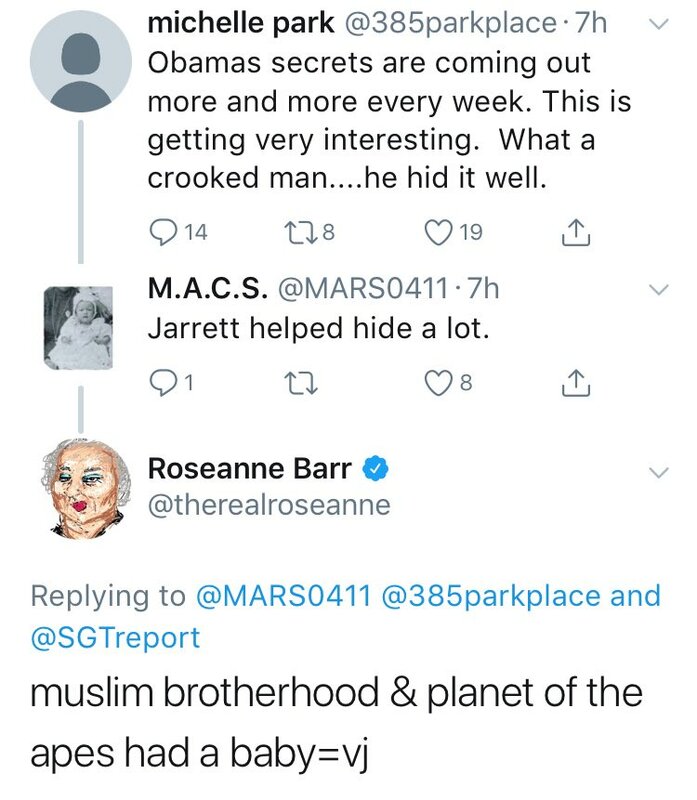 What put Valerie Jarrett in the news before Roseanne's tweet? When I read the news about Roseanne Barr insulting Valerie Jarrett, I checked Jarrett's Wikipedia page to see who Jarrett was. As far as I can tell, she was a member of the Obama administration at the level only politics nerds hear about (can you name the previous Director of the Office of Public Liaison, or the current one?). But not only is Roseannne tweeting about her, but Skeptics.SE has a popular question about a forged image libeling her. Why has Jarrett come to sudden prominence? Valerie Jarrett is prominent because she is a long time friend of Barack Obama's (she hired Michelle in 1991). Her title in the White House was smaller than her role in the White House. She was more like Jared Kushner or Ivanka Trump in that regard. All three have or had titles that were somewhat blah, but they also have or had the ear of their respective presidents. There are probably many people around the country who don't know who Valerie Jarrett is, but that's not because she did not have impact. It's because most of her impact was in her communication with Obama in private rather than communicating with the public. Apparently, she was put in the news mainly by Roseanne Barr's tweet. The tweet itself was published in the discussion about President Obama's alleged interference in the US and French elections. Valerie Jarrett was targeted as a prominent member of the Obama administration. Now, I can't say for sure why @MARS0411 decided to single out Jarrett as a person responsible for helping to hide "Obama's secrets". @Brythan and @hszmv already explained why one might consider her an influential or controversial figure. The first tweet was seemingly inspired by the allegations of CIA involvement in American and French elections during the Obama administration. Allegations resurfaced on May 23, 2018, in the Twitter conversation between President Trump and Wikileaks. It seems plausible that Jarrett was on a few conservatives' minds recently because of that. I'll try to be neutral. I am sure this will upset both people who wish that I was more critical of the right and the ones who wish that I was more critical of the left on this. But I will only answer the question of why Valerie Jarrett's name is better known than that of her predecessors or successors. Valerie Jarrett's fame or notoriety (depending one's point of view) resulted from Glen Beck hammering at her during the initial years of Obama's administration. Glen Beck had a very highly-rated TV program in which he DAILY attacked a few of the top Obama administration officials for some statements which they made at one point or another. Most of those people saw their names brought into public light much more than their positions merited. A number of them (Van Jones for example) even capitalized on this newly-found public recognition to take their careers in public life to a new level. Valerie Jarrett had some news media presence on CNN during the Lame Duck Period of 2016 where she said that Obama's presidency was remarkably "Scandal-Free". This has been a minor talking point in conservative media as there were numerous scandals that arose during the Obama Administration (Wire Tapping of Media, Fast and Furious Gun Running, the IRS Audit Targeting of Conservative Organizations) that they point to to suggest that her statement was misleading. Not the answer you're looking for? Browse other questions tagged united-states cabinet scandal or ask your own question. Can the US president get around rejected cabinet nominees by not nominating a replacement? Did Juanita Broaddrick testify under oath against Bill Clinton? Where can I find official reasoning for political stances? Did someone in the FBI pressure Comey into releasing Hillary news just before the election? Why do people call for office holders to resign? What consequences does that bring? Does Trump incite more news articles than Obama, Bush, or Clinton did?